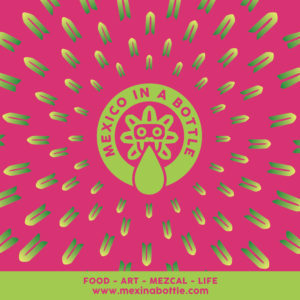 The tina is the fermentation vessel for mezcal. The exact translation in Spanish is tub, bathtub, vat, or large jar. Traditionally these are made from wood similar to a large wine barrel with an open mouth. Originally fermentation vessels were animal hides and naturally occurring rock holes. The wood tina now dominates the mezcal world. They are used repeatedly, and when I’ve asked mezcaleros for how long I’ve never managed to get a good answer. The wood type includes pine, oak, and cypress but I wouldn’t be surprised to find other types involved. 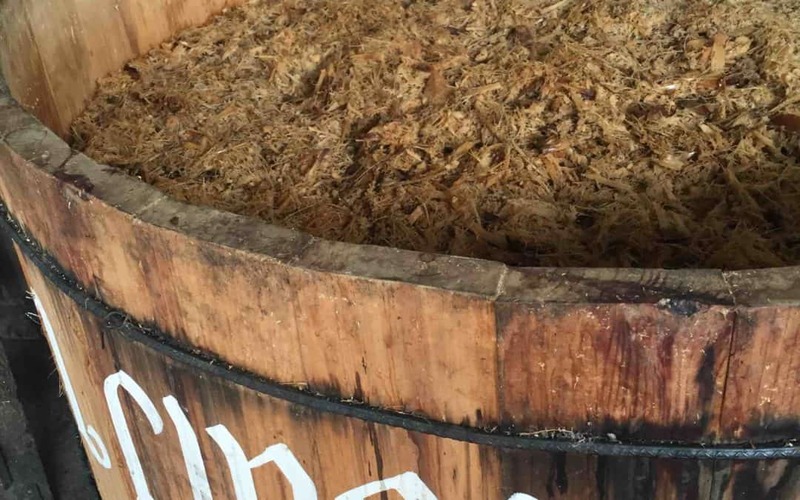 Many tequila producers use a very similar fermentation vessel which can be called a pipon while some use the “tina” term just like mezcal. The 3,400 liter fermentation vats at Tequila Cascauin. These are stainless steel tubs. Just a few of the fermentation tanks used at Tequila Cascahuin. These are stainless steel, each holds 11,080 liters. 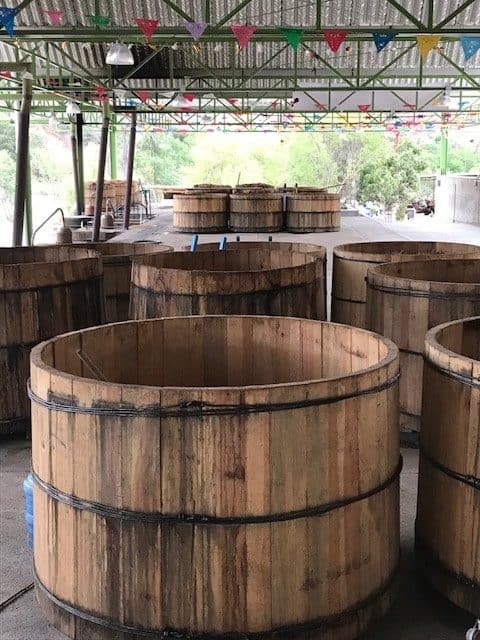 The approach to fermentation in the world of mezcal is rather unique within the larger spirits universe because these vessels are made of wood, open to the environment, and depend on wild yeasts for fermentation. Most other spirits try to control the fermentation process closely by using synthetic fermentation vessels made of stainless steel, aluminum, plastic, or concrete. 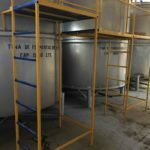 Generally they’ll also enclose these vessels within a factory like setting so that they can exclude wild yeasts and encourage the interaction of the commercial yeast they use for fermentation. So, when I say that tinas are open to the air collecting wild yeasts that’s the fermentation process, just stand back and let nature take it’s course. Once agaves are roasted and crushed the mash is placed in the tinas, they are topped up with water and the wild yeasts in the surrounding environment take over to do the work of consuming and transforming all the sugar in the tina into alcohol. That’s it. 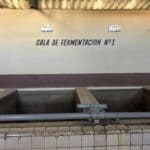 Generally fermentation takes days and it’s yet another part of the mezcal production process that requires close attention because, when the yeast take over, they can really get bubbling. Frequently the fermenting mash needs to be held down with weighted wooden beams. Some agaves like the Jabali are notorious for their vigorous fermentations and require even more attention and constraint. 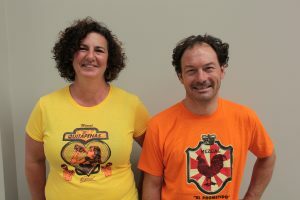 The vast majority of spirit producers including almost all tequila producers, use commercial yeasts in highly controlled environments in order to ensure consistency, the same goes for most beer and wine producers. 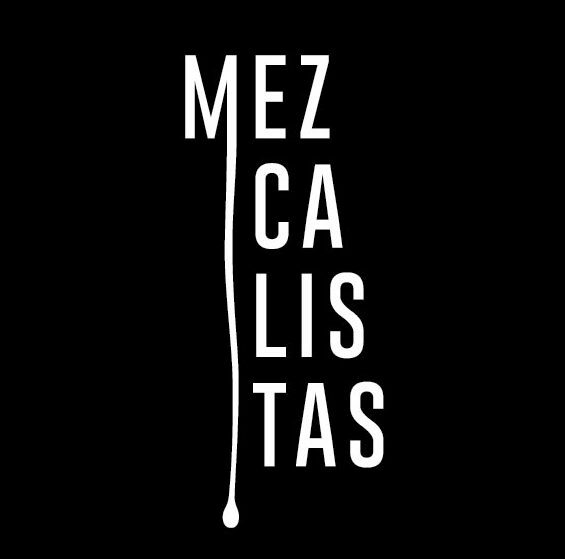 Mezcal’s wild yeasts are one of the key differentiators in their flavor because the yeast bring with them flavors from the surrounding environment, especially the fruits and flowers. Frequently you’ll see a special type of fruit or flower grown around a fermentation area, that’s most likely because they’ve been there for a long time and are known to give the local yeast a distinct identity. The wild yeasts in mezcal are responsible for a wide variation of flavors, perhaps second only to the agave itself for the nuance in mezcal. Tinas at the Del Maguey palenque where Vida is made.